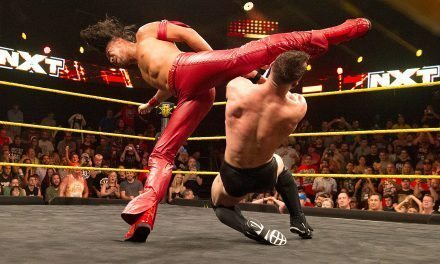 Tonight’s WWE NXT is the second consecutive episode emanating from the CFE Arena on the University of Central Florida campus. Last week’s crowd was a non-factor despite the increased size, and the episode was pretty inconsequential itself. We’re getting close to the actual build for WWE NXT Takeover: Dallas, but the holding pattern is getting stale. Quickly. Thankfully Asuka and tonight’s main event both help make this an hour worth watching, holding pattern or not. Let’s dive in. The CFE crowd went absolutely bonkers for Enzo and Cass, even more than they were for American Alpha, who I believe often have NXT’s largest pop. The makeup of the match, especially the four-on-four brawl that starts the bout, smells of the “let’s get everybody on the card for the big show” type of thing we see on Takeovers and the matches taped for weeks after. This was super quick for an 8-man match, but the undeniably coolest moment was the combo-hot-tag with Big Cass and Jason Jordan. The whole mess included suplexes, big boots, flapjacks and a Grand Amplitude that was broken up before the three-count but immediately followed by an Air Enzo for the win. No snowflakes, but the CFE crowd got their fix. Purrazzo tried to start the match throwing with Asuka, which is a silly thing to do. Asuka, in her perfect brutality, started by switching from suplexes to submissions with sublime fluidity before getting fed up and ending Purrazzo’s night with a pair of spinning backfists and a roundhouse kick. These meaningless (pre-Aries) NXT episodes are being carried by the pure badassery of Asuka, and, unlike Baron Corbin’s unstoppable run, Asuka has a personality without really any words. Eva Marie and Nia Jax cut a menacing promo backstage after Asuka’s match, far away from any backfists or roundhouse kicks. They’re also going to break Asuka. You know, Eva Marie might be one of the worst things on NXT, but her lipstick is fascinating. Her mouth looks like a cartoon. Alex Riley looks like he’s going through some stuff. Actually, if I had to guess at his gimmick, it would be Alex “Going Through Some Stuff” Riley. Unfortunately, Tye Dillinger currently has the golden horseshoe carved into that ridiculous hair. Dillinger wins with a rollup in under 5 minutes. Finn Balor puts over both Samoa Joe and Sami Zayn in a backstage promo saying they’ll both do whatever it takes to get a shot at the NXT Championship. It was a fine promo, but the edit at the end was really rough and abrupt. And it wasn’t the first odd edit in the episode as Dillinger’s exit from the last match was oddly put together as well. The Baron Corbin-less rematch for the No. 1 contendership to the NXT Championship surpassed the fun triple threat from a couple of weeks ago. For his part, Samoa Joe has been rejuvenated since his NXT run started in earnest. I saw him on his ROH tribute run and he was plodding and uninspired. The state of Joe when he left for NXT had me worried about his ceiling in Orlando, but he’s been every bit the stalwart we hoped for. And as much as I miss skinny Sami with hair (both on his chest and on his head), he’s still the best pure babyface left in the company. On either roster. In addition, I don’t think anyone in the company performs as well against a powerhouse opponent, that includes selling as well as believably getting his offense in. Offense, however, was little and less for Zayn in the early going. Zayn’s uprisings were all stymied by Joe’s size and power until Zayn fought through Joe’s defense for a Blue Thunder Bomb to send the match into act II. The Blue Thunder Bomb, like most of Zayn’s offense, came off a counter. Zayn’s next big opportunity came from a counter into a Koji Clutch attempt which Joe blocked, but another counter shortly after turned into an exploded suplex. Another series of counters in the closing stretch included an exploder suplex, a Coquina Clutch, a Muscle Buster attempt and a Helluva kick into a three count. But a three count for whom? After Zayn hit the Helluva kick he fell onto Joe, covering him. Zayn’s shoulders were also down and Joe had an arm and a leg over Zayn. 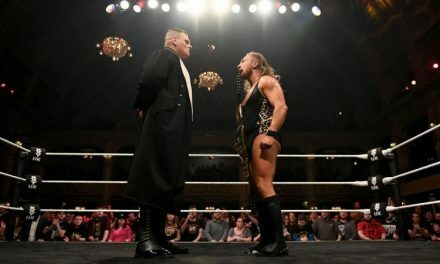 After lots of yelling and booing, WWE NXT senior referee (a title I just made up) Drake Wuertz told Commissioner Regal that he was calling the match a draw, much to the chagrin of Joe, Zayn, Regal and the thousands of fans in the arena. NXT closes with a perplexed Regal and Zayn storming up the ramp.